Antibiotics are a literal God-send when it comes to medical discoveries. Infections that once took many human lives are now easily treated with the miracle drug of penicilin. However, we have all heard of the daunting crisis that haunts this next generation: antibiotic resistent bugs. Overuse of antibiotics, whether taking directily as a perscription, or consumed through meat or dairy products where the livestock were given antibiotics, also has a large role to play in gut health and the epidemic of chronically weak immune systems. I want to discuss several infections that Americans are very quick to run to antibiotics for, but are not always nessessary cases to treat in this regard. (1) Ear Infections: Now a natural part of childhood and less often adult hood, but one of the main scenarios where parents RUSH to antibiotics. I want to share a little story: My son Elias had a fever spike to 104. He was burning up and so miserable (I believe this was before this first febrile seizure). We brought him into the ER and they said he had a terrible ear infection and prescribed him oral antibiotics to take 2 times a day for 10 days. My husband picked up the thick pink syrup and we sat in bed with him at 2am, when my husband got home, and just prayed. I looked at that syrup and knew it would take 1-2 years to rebuild his immune system after we had given him the prescribed doses. We decided to wait the night and decide in the morning. We agreed on garlic tincture orally and in the ear. Our pediatrician agreed with us and we started treatment. he recovered fully in only 5-6 days but we continued our natural treatment for 10. Even if they had prescribed antibiotic ear drops I know they can created resistant strands of ear infections and would have made the same decision. (2) Strep Throat: Our family has had 2-3 strep throat outbreaks all of which we never used antibiotics. We treat this with a nice strong fresh garlic tea, some raw apple cider vinegar, raw honey and some cyanne pepper. 3-4 cups of this a day and strep throat was gone in less than a week. It also works preventativley when taken by uninfected family members. Now, somthing we take that is even quicker to prepare only when tea is just not an option is Ancient Medicine Cabinet’s Garlic Tincture. 4-5 doese of this a day and it has the same effect, but is lacking in the soothing power of a warm cup of tea. (3) Sinus Infections: There was one year where my immune system was WIPED OUT and I got two sinus infections. Once I was pregnant and got a horrible sinus infection. My midwife educated me that most sinus infections are not infections at all. They are viral. 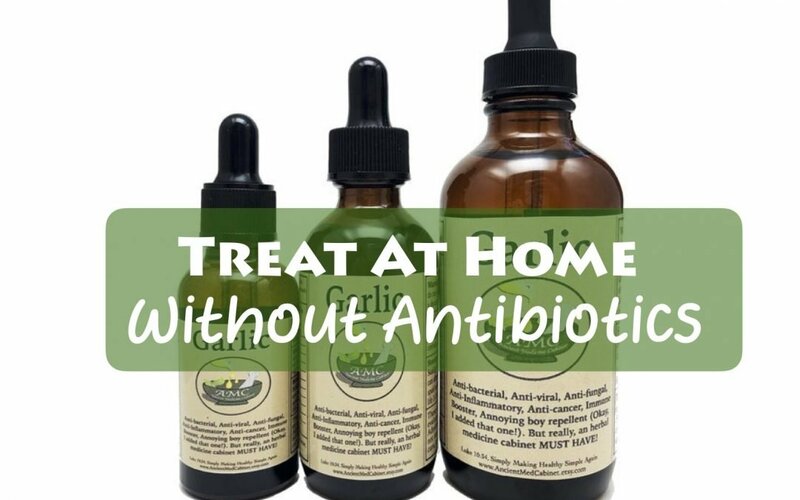 Antibiotics are not needed and usually don’t even work to help treat the problem! I took the garlic tincture and used my Neti pot for 2-3 rinses a day for relief. Within the same amount of time antibiotics are said to work, my natural regime brought complete healing. (4) Yeast Infections: Yeast is a nasty little booger! If you have already been on some antibiotics, you know the yeast infections (and recurring infections) that follow just one treatment. This happens because antibiotics kills all the good and bad bacteria in your body, but doesn’t affect the yeast in your system. More room to grow yeast! And they take advantage of the extra space. Garlic is yeast’s worst enemy! Candidia! CHARGE! Taking a garlic tincture, eating or swallowing chunks of raw garlic, even making a raw garlic clove “tampon” to wear over night are all sure ways to kill off extra yeast in no time. (5) Bacterial Diaper Rashes: Diaper Rashes are bound to happen to a baby at some point. Instead of rushing to your pediatrician when one occurs, try a simple blend of coconut oil and tea tree oil. Both of these are antibacterial and antimicrobial and should clear the infection up in a matter of days. We just had this issue with our youngest this last month. (6) Pink Eye: A lot of cases of pink eye are not bacterial and therefore do not need antibiotics. Similar to sinus infections, they can be viral or even allergy related. My oldest girls have horrible allergies and get nasty looking pink eye and even allergy shiners several times a year. Whatever the cause, bacterial, viral, or allergy related, a simple saline solution you can make at home, or raw honey (what we prefer) solution can treat pink eye effectively and prevent it from spreading. I think you see the resounding theme of the Garlic Tincture! Our family has a 4ox of this on hand all the time. You never know when a virus, infection or other issue is going to arrise! You can get 10% off using the promo code DEPUTIETRIBE10 at check out. Obviously, do your own reserach, talk it over with your spouce, pray about it, and try it out! We are blessed with a pediatrician who is very “natural” minded and would prefer us to take the natural reoute before we turn to medication in most cases. This encourages us and gives us the boldness to move forward. What Have You Sucessfully Treated in the Past?!? Tell Your Story BELOW!